So I save patterns. I have patterns from the 1960s. Some I keep because I want to make it some day. Some I keep because they give me inspiration to do something like it. Some I keep because they teach me color management, which I am not very good at. One day about a month ago I got out a bunch of my pattern boxes and started going through them just to remind me what I have saved. I found a Fons and Porter's Quilting Celebrations magazine from September 2013. It had several fall patterns I liked. There is one called Thanks. It is a round pattern that can be used as a table topper or a wall hanging. I decided I had to make one. I started drawing the pattern onto fusible web and thought, "I'll make three." So I drew out enough for three. I found fabric I liked. I did not have enough of any one fabric to do all three, so they have different fabrics for everything except the pears and the pumpkin. I just finished putting the binding on the last one today. I put them next to each other on the floor and was trying to decide which one I was going to keep and which one I would send to my sister and the last would go to my mother. Hmmm. Hard decision. Each one has something I like better than the other two. Each one has something I did wrong but didn't on the other two. Hmmm. Not sure. Yeah. Maybe I should just keep all three. No. No. That would be redundant. Help me choose. 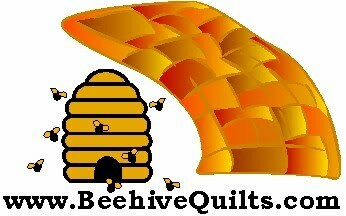 Send me an e-mail at contact@BeehiveQuilts.com or comment below. I will post which one I kept in a few days. I am a member of the River City Quilt Guild. 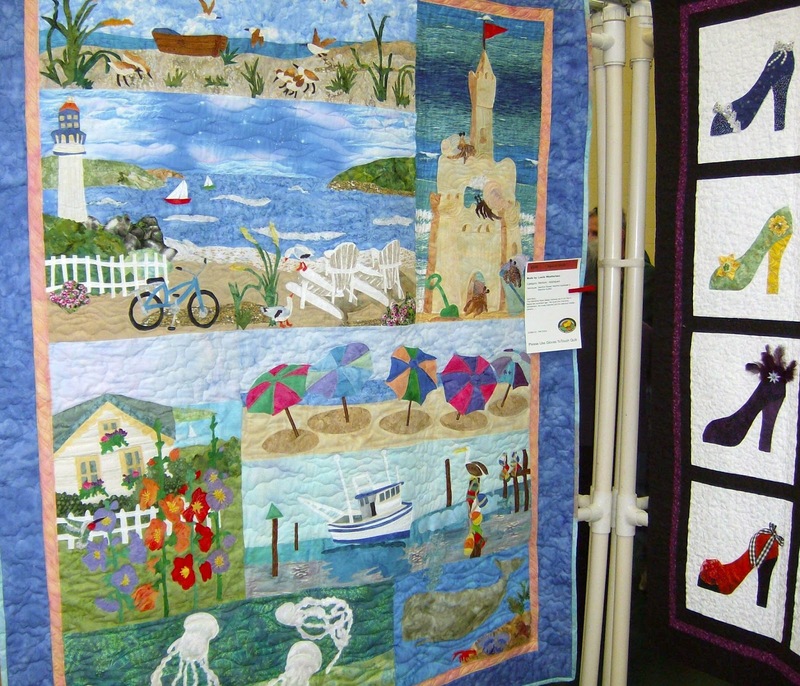 Each year we put on a fantastic quilt show on the second weekend in November. We are just finishing up the run today. It is a three day event open to the public. Judging of quilts is on Wednesday. Set up is on Thursday. The show is Friday, Saturday and Sunday. It is amazing to be part of this show and see all it takes to put it on and have it be so successful. I used to go to shows and just enjoy what is on display there. Now I am so much more appreciative of all the hard work. It is appreciated to all guilds and there shows, not just River City's. There were over 200 quilts on display at that show and numerous vendors there, too. The quilts this year seemed to take on a more artistic side. I love traditional quilts, but I truly appreciate all the work that is involved in doing the art quilts. I took a few pictures of what was displayed. I hope you enjoy looking at them. Día de Las Muertas - Day of the Dead. Always have to include a Halloween. This is one I would make but it would probably take me 15 years to complete. There are a lot of small pieces that were needle turn appliqued here. Love it. I love hats. I love this quilt. This is a small wall hanging but it is stunning. It is covered with embellishments of buttons, ribbons and shiny objects. I took a close up in hopes you could see some of what is there. See below. These are five quilts made by five different people. Below is a picture of the explanation of the quilts. Very unique. They could be hung alone and be stunning, but they really need each other to tell the whole story. Another Halloween inspired quilt. Sorry the picture is a little fuzzy. I was taking the pictures in between people trying to get up close to it. I really like this quilt. This is one of the featured artist's quilts. I just love the yellow background. And look at that border. I think the unique border is what makes this quilt. Another of the featured quilter. I took this picture as a close up to a quilt that had a bunch of 3D effects to it. I failed to take a picture of the quilt itself, I guess. I need to do more 3D embellishment on my quilts. I really like the effect it gives to a quilt. Love all this but especially the snowman in the middle. Very small quilt with very small embroidery. I love to do embroidery and have a lot of respect for this work. This is a tiny quilt (around 24" square). Imagine how small that piecing is! Another small quilt - 17" square. It has a lot of embellishment on it to make it look like a true night scape. Very nicely done. This is a close up of the quilt below. All those white "squares" are individually cut and sewn onto to the background fabric. The background fabric has a little puffiness to it which gives the quilt some dimension. I like the overall effect this process gives the quilt. This is a very large quilt. Look at the border! Just magnificent. Pretty wall hanging. The geraniums are 3D. Pretty cool. Very watery or fluid looking quilt. This is a quilt that was made from blocks in a winter themed block exchange. I was involved in this exchange but have not finished my version of the quilt yet. I love how this was put together with the piano key inner border that brings the colors together. FYI the snowman and the sled are blocks I contributed to it. All so pretty. I really love lighthouses, so this quilt grabbed me right away. I especially love it because the quilter added dimension to it by adding netting for the waves. Good job. See up close picture below. Love the colors in this quilt and that border is divine. Very nice quilters. I cannot even say ladies, because our guild has several men participating in it. So just a good job to all. Maybe I will even enter one of my quilts next year. We will see. My friend, Venita, and I went for a two shop visit a couple of weeks ago. We had a great time. We started out early and hungry. Venita had researched where the best place for breakfast/lunch was in Placerville and came up with a delightful restaurant called Sweetie Pies in downtown Placerville.It is housed in an old house with a dining patio out front. We had a great breakfast. I had eggs benedict where they used ham instead of Canadian bacon. Yummy. Venita ordered from the "light" menu. She got scrambled eggs, bacon and one olallieberry pancake with olallieberry syrup. That "small" olallieberry pancake was bigger than a dinner plate. Not such a small breakfast afterall. They also sold pies and breads. I bought a loaf of apple cinnamon bread to take home. Toasted, it was the best. Venita took home an olallieberry pie. It was a hot day. I'm sure by the time she got home, her pie was nice and warm and ready to have ice cream on top of it. 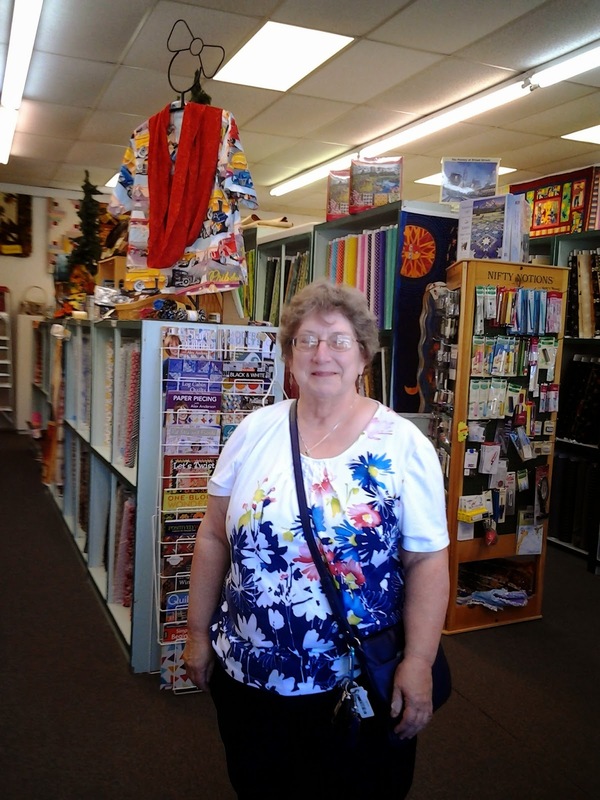 After breakfast we headed out to find High Sierra Quilters in Placerville. It recently moved there from Cameron Park. What a treat it was. It is a relatively small shop, but it has a lot of fabric to choose from. I needed several different colors for borders on star quilt top I had made. I found all that was needed there plus a little more. Venita found a couple of panels and other fabrics for quilts she was working on. We had the store owner take a picture of us under their quilted sign with my phone. I didn't check until we got home and found it didn't take, so I can't share that with you. 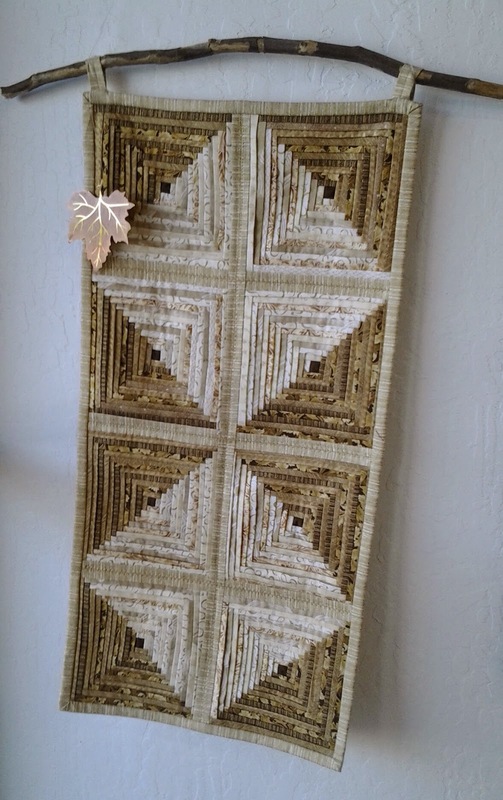 I did take the following picture of a sample quilt hanging on their wall. It is so beautiful. The piecing is about 1/4 inch thick. Wow! After having fun there, we headed for highway 49 that runs between Placerville and Auburn and through Coloma. Coloma is where Sutter had his gold mill back in the 1800s. It is a beautiful drive. Easy for me to say, as I was not driving. Arriving in Auburn, we quickly found the quilt store there thanks to a smart phone GPS. From the outside, the Whistle Stop Shop didn't look all that big. But it is good sized. They moved from Colfax a few months ago. I loved their little shop there, but it was not a shop I went to often, as it was quite a drive to get to. This one still isn't really close, but we do travel through Auburn more often. I did spend quite a bit of money there. I bought some fabric, of course. I also bought a pattern that I am busy making. It is a salmon table runner pattern. I am putting two salmon tail to tail on variegated blue material. I have one sewn down after fusing it to the background fabric. I have the other one fused but not sewn down yet. That is a lot of work. It will be a gift for my brother, who is an avid fisherman. The picture below is Venita in the Placerville store. It is a little fuzzy of Venita, but it shows part of the large array of fabric the store carries. We had a good time. We will have to do it again when she gets back from her travels. Have a good time, Venita. In February my friend, Venita, and I went to Modesto to a Ricky Tims Seminar. It was three days of great fun as we listened to Ricky, Pam Holland from Australia and Alex Anderson talk about their inspiration, perspiration and accomplishments. [See my February 2014 post of this event.] 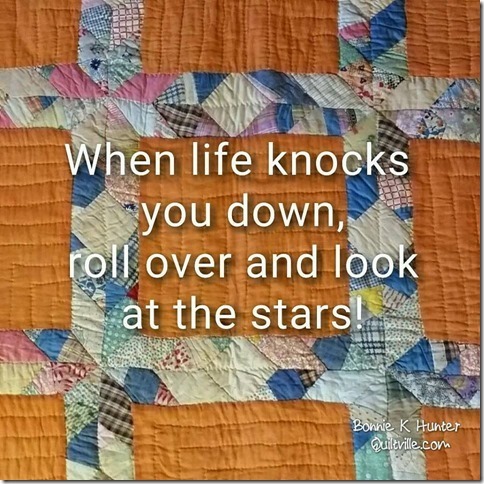 Great incentive to Keep on Quilting. During one of Ricky's seminars, he showed us his Harmonic Convergence quilts and how easy it is to make one. I thought I can do this. So I on the way home, Venita and I stopped at a couple of quilt stores. I purchased the fabric to make the above quilt. That was Saturday. On Monday I entered my quilt studio hoping I could remember all he said or at least my notes would cover what I couldn't remember. After just a few hours the top was done. So easy. After I finally quilted it, I took it to my guild for show and tell (or Chantell as Ricky calls it). As I mentioned the pattern name, I said I bet most of you have probably made one of these quilts or are aware of the pattern. Lots of nodding. My first thought is they have done this and are not interested. Wrong. Many probably had done it or seen it done and was not interested, but a lot of people asked me what the name of the pattern was again and the ease of it all. Our guild president is a gentleman that has been a member along with his wife for many years. He is just getting into piecing himself and said it would be a long time before he would attempt something like this. I told him actually he could do it now because it is super easy. It really is. It is just strip cutting two coordinating or contrasting pieces of fabric and then putting the strips back together again in reverse order of each other. Love the technique. Love the ease of making a quilt that people oh and ah over. I especially love the fabric I chose for it. If you ever get the chance to go to a Ricky Tims' Seminar, go. It is so worth the time and the money. At a yard sale, I purchased several small wall hanging kits. That was several summers ago. As I have had to narrow down my sewing area recently, I came across them. My decision was to donate them to my guild or make them. I decided to make them and I am glad I did. Easter Chicken was completed just before Easter and looked so cute on the wall for that day. Spring Strawberry went up on the wall as soon as Easter was over. Love its bright red berry. I love making small quilts. The strawberry one was completed in less than a day, start to finish. Gives me a real sense of completion. I still have at least one more of these small kits. The one I remember having is an ice cream cone. Perfect for the summer coming up.